LEAH FRASER: ARTIST OR SORCERER? 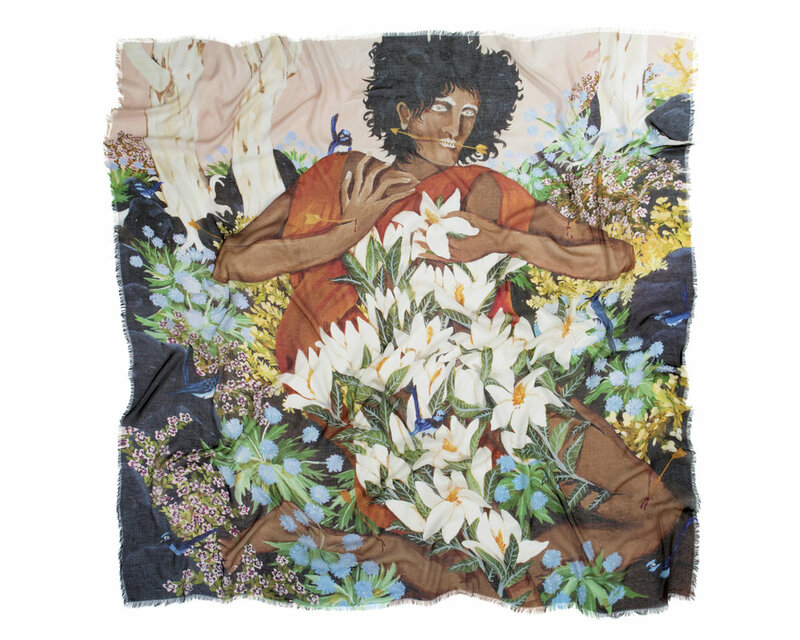 Sydney-based artist Leah Fraser is a modern day Scheherazade. Her lyrical paintings tell stories of shaman-like characters travelling through mystic lands in search of spiritual metamorphosis. Decorated in ritualistic clothing, her figures seem to grow from nature, exploring mans deeply intrinsic relationship to the natural world. Fraser’s latest work takes us on a journey, foraging through rich thickets strewn with wild flowers and humming with birds to discover a woman, pierced by arrows and yet, ‘Her beauty was visible still’. We have translated this dream-like scene onto a luxuriously soft cashmere modal scarf. Hand-fringed, it drapes beautifully on the body, exposing different elements of the artwork each time it is tied, whether it be a floral motif, trees against a dusk sky, or the Artemis-like figure herself. Fraser, be she story-teller, witch or artist, has shrouded us in a magical scarf worthy of a shaman. Shop the limited edition Leah Fraser cashmere blend scarf here!